TO: All Elementary & Middle School Art Teachers. What: Recognition of elementary and middle school art students from Walworth County. 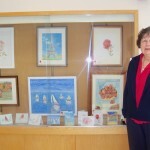 Who: The art teacher from each school may submit up to ten pieces of art for the exhibit. Please send the names and grades of selected students to Walworth County Arts Council, “jatkinson619@charter.net”, so certificates of participation may be prepared. 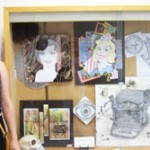 The art teacher is responsible for displaying the various student projects. On the day of the exhibit, April 17, each school art teacher sets up their display table prior to the beginning of the program. Teachers may bring easels to use in addition to the table that is provided. What: At the program the art teacher is introduced and the teacher introduces each student who then shares their work with the audience. Immediately following this presentation, a school group picture is taken. A copy of the picture is sent to the school for any publicity the school may wish to pursue. Time: Program begins at 1:00 PM. Set up for artwork will be 12:15 until the program.